Can dogs eat bananas and banana peel? Bananas have many health benefits. They’re high in potassium and are a good source of vitamin C too. Not to mention vitamin B6 and fiber. And bananas are low in cholesterol and sodium too. So it’s no surpise they’re one of the most popular fruits with us humans. And dogs get all the same health benefits too. The only problem for dogs is the amount of sugar that bananas contain. And this is the reason why it’s recommended you only feed bananas to your dog in moderation. Don’t make them an integral part of your dog’s regular diet. Keep them for use as a special treat. And when you do give your dog bananas, make sure you only give them thin slices. Why do I say this? Because of the potential side effects of bananas for dogs if you feed them too much. If you give your dog too much banana, they may get constipated. Large pieces of banana can cause blockages because bananas are hard to digest. Or your dog may suffer the opposite side effect – diarrhea – due to the high levels of fiber found in bananas. And as mentioned earlier, bananas are rich in potassium. Too much potassium can cause heart problems for dogs. Some dogs are also sensitive to bananas. The bananas can cause them stomach problems. So if you’re planning to start giving your dog bananas, check with your vet first. And introduce them to their diet bit by bit, while you keep a look out for signs of your dog being unwell. For example, keep an eye out for weight changes or a sensitive stomach. I should also point out that some dogs just don’t like them. So while they can eat bananas, they’ll just refuse. And that’s fine. In that case, just don’t give your dog bananas. How much banana is safe then? The actual amount of banana you can safely feed your dog depends on the size and weight of your dog. In general, it’s okay to give half a banana to a medium-sized or larger dog a couple of times a week. For smaller dogs, you should restrict them to only a few small, thin slices of banana a few times a week. The best way to find out for your own dog is to start with these guidelines and increase or reduce the amount if needed. One other point is that you shouldn’t ever feed banana peel to your dog. Although one banana peel won’t cause your dog any problems, it just isn’t good for them. Too much peel can be toxic. And banana peel can also have pesticide residue on it. The peel can also clog your dog’s intestines. This is especially true if your dog swallows it without chewing it properly. 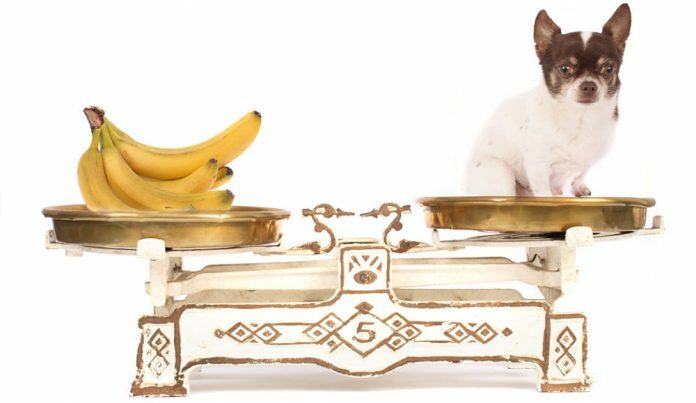 The answer to the question “Can dogs eat bananas?” is yes, bananas are quite safe for dogs when eaten in moderation. But avoid making them part of your dog’s normal diet. Instead, keep them for special treats. And don’t give your dog banana peel. He should be fine. It won’t be toxic to him and while it probably won’t be fully digested by his system, it shouldn’t cause a blockage. Keep an eye on him just to make sure though, and look out for vomiting and/or diarrhea. If there’s a blockage he’ll likely have abdominal pains and struggle to defecate. If you see this, or you’re worried, get him checked out by a vet. How long should I watch for problems after he ate the peel ? Most problems (e.g. vomiting) occur within a few hours of eating the peel.